Most robberies are over in a flash as criminals don’t like to linger or have a nice chat afterall. It is vital to keep yourself and the people, along with a maximum of the material property around you, protected. Prioritise the safety of people including staff and customers over that of your property, which can be replaced unlike lives. Train staff beforehand to recognise criminals at a glance and to be again to act wisely under pressure by contacting an authority, or to defend themselves properly. As long as you deem it is safe, activate any existing and installed alarm. Any useful device, such as an emergency phone whose lines cannot be tampered with, should be used with caution and without alerting the criminals. Escape- Mode of transport used by offenders; make, model, colour, index. Cases of repeated robbery are unfortunately a reality, especially if the first attempt was a successful and worthwhile one. 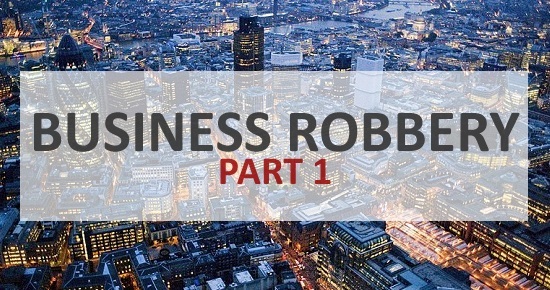 Therefore, it is the duty of the owner to minimise rewards, which will automatically mean minimising the business’ losses and discouraging the criminals to visit again. Of course, the aftermath of the robbery has to be dealt with, too. This will be covered in the next article Business Robbery – Part 2.